The revised Chrysler Ypsilon is now on sale with prices starting at £9895. The updated range now features a new entry-level model along with a 'premium' model. Other changes include extra standard equipment, new colours and new trim names. The Ypsilon Silver replaces the S trim and gets a new seat design and detail finishes. Three new colours are also available - Marble Grey, Khaki Grey and Sapphire Blue. Linked to the colour is a choice of finishes to elements such as grille, door mirrors, whel trim centres and dashboard panel – all of which are available in either gloss black or matt dark grey. Added to this, the final accent colour is also selectable between Coconut, Watermelon or Lime, dependant on the body-colour. The Ypsilon Gold replaces the SE but gains Blue&Me as standard/ This allows the driver to connect an external music device and includes Bluetooth. At the top of the range is a new Platinum trim which comes with 16-inch alloy wheels, automatic climate control, rear electric windows, cruise control, part leather seats and Magic Parking, which helps the driver park in tight spaces. 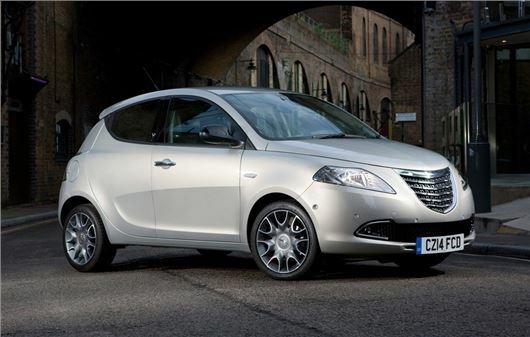 As before the Ypsilon is available with three engines - a 1.2-litre 69PS petrol, a 1.3-litre MultiJet 95PS diesel plus the 0.9-litre 85PS petrol - essentially the TwinAir engine from the Fiat 500.